Create a rustic-inspired look while adding versatile storage options to your bedroom with this dresser from the Better Homes & Gardens Modern Farmhouse collection. This beautiful chest of drawers features six easy gliding drawers that open and close on smooth metal runners, making them ideal for convenient storage of an array of different items like stacks of button up shirts and blue jeans to your collection of old t-shirts and sweat pants. It has room for all of your stuff! Its spacious top surface provides you with additional space to store bedroom items and display your favorite home dcor like an accent lamp, your makeup bag, bottles of perfume and pictures of your family and friends. Its simple design and charming good looks make this dresser a perfect fit for your bedroom. 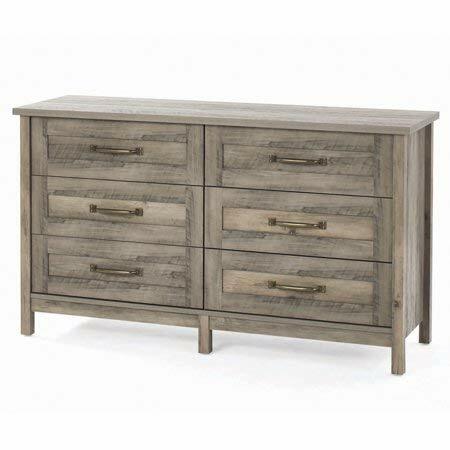 Finished in Rustic Gray and detailed with antique brass metal hardware, this beautiful dresser gives your home the style you want with the functionality you need.